Not sure why to capture your documents? 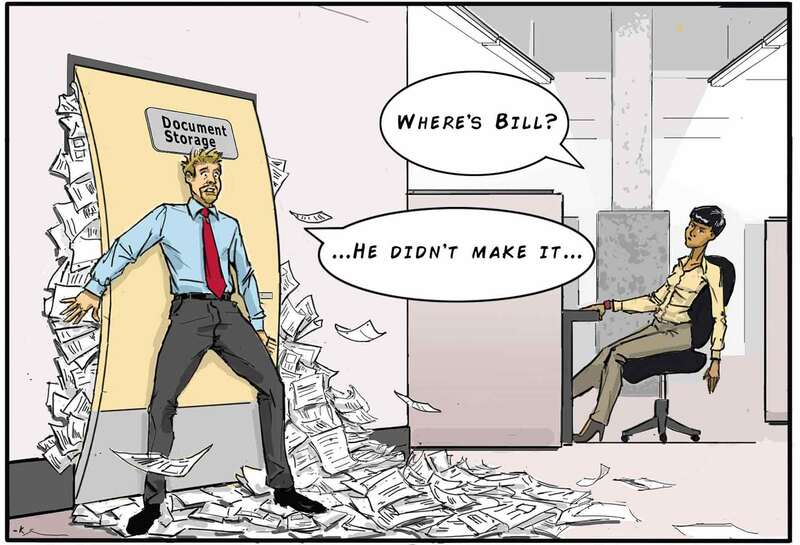 Not sure what the benefits are for using Document Management System? Join us to learn the top 3 reasons why organizations choose to capture their documents and use a document management system. Also, discover the 4 questions that can make an impact to your bottom line and efficiency. See how the complete process can improve your operations and more…. Call (800) 858-5544 / (949) 709-5838 or visit us at www.informdecisions.com for more information about the Webinars. 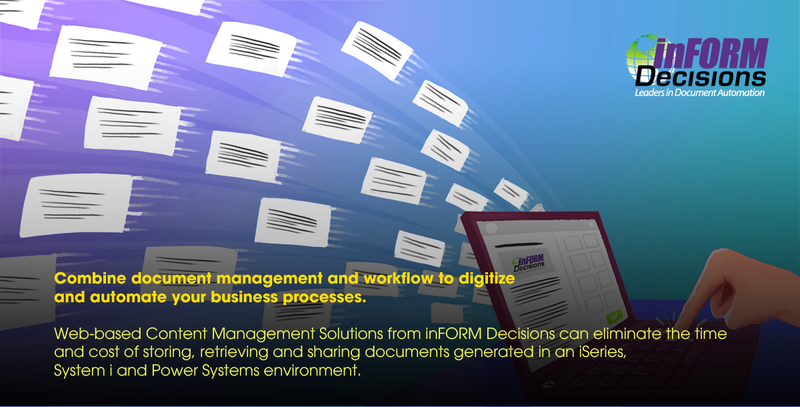 Combine document management and workflow to digitize and automate your business processes. Web-based Content Management Solutions from inFORM Decisions can eliminate the time and cost of storing, retrieving and sharing documents generated in an iSeries, System i and Power Systems environment. Want to fully understand the AP automation and discuss your needs? Contact inFORM Decisions today at (800) 858-5544 / (949) 709-5838 or visit us at www.informdecisions.com for more information about our acclaimed suite of products and see how we can help you reduce paper, increase productivity and lower your costs. AP automation is a term used to describe the ongoing effort of many companies to streamline the business process of their accounts payable departments. The accounts payable department’s main responsibility is to process and review transactions between the company and its suppliers. Automating the invoice payment process. Why the need? Do the math! •	The average manual AP invoice costs $30.00 and the average AR invoice $4.00 per invoice. •	On average the cost of a fully automated AP invoice is $3.50 and the AR invoice $2.25 per invoice. •	The cost savings for the AP invoice is $26.50 per invoice and $1.75 for each AR invoice. •	That‘s a 90% cost savings for the AP invoice and 44% for the AR invoice. •	A paper invoice storage cost is $3.90 per invoice and the AR invoice is $1.90. •	Whereas the electronic invoice storage cost $1.30 per invoice and the AR invoice is $1.30. •	The cost savings for the AP invoice is $2.60 per invoice and $.60 for each AR invoice. •	That‘s a 67% cost savings for the AP invoice and 32% for the AR invoice. The cost savings are significant, but even better; there is a 37% error reduction with automated invoicing. What does AP Automation mean to me? What to look for in a solution. The AP automation provider is one of the determinants deciding the success or failure of your AP project. You should consider a vendor that can equip your company with all of the features your AP department needs. iCapture is a typical example that provides a layered approach to the invoice problem, helping you improve efficiency and many other benefits. Check that the software can be easily integrated with your other systems. Learn about the software’s security and compliance options. Most importantly, insure that the solution can be tailored to your organizations size and scope and fits your specific needs and will integrate with your ERP system. Document capture software is an intermediary application that sits between an image source (scanner, copier or folder) and an end destination. The software “captures” images and data, and has a focus on automating the process of scanning, splitting, extracting and exporting documents. It relies heavily on sub-technologies like Optical Character Recognition (OCR) and Advanced Data Extraction (ADE) for automation. Critical to the end result of capture software is the process of release or migration of documents and data to a back-end system or repository. 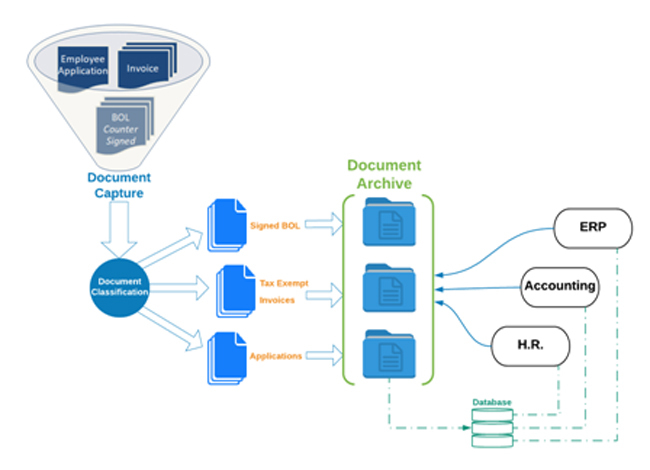 Capture is typically referred to as a “front end” as it is usually the first line of operations to digitize paper documents. It is similar to document imaging and scanning software, but focuses on automation. Do Invoices Really Have to Be So Painful? Shipping and Mail– Many organizations with remote locations and branches still ship invoices to a central accounting office for processing. This creates time delays, and the opportunity for invoices to be misplaced or lost entirely. Some utilize “digital” invoice shipping, through the use of a scanning copier or a network scanner. This can add additional pain for the folks in the head office, that typically download, rename and save invoices in digital form. Some organizations will even print scanned invoices, to have a single flow of processing. Payment Cycles – According to IOMA, 25% of all invoices are paid late. Studies have shown that late payment is usually due to processing delays, and are quite typical in paper-based accounting workflows. Data transfer and entry errors can also lead to delays, as well as increased time to search file cabinets for errant invoices. Searching and Locating – In a previous life, my office was right outside a file cabinet row for accounting. There was a nice lady named Joan, who spent her entire day walking back and forth, looking for invoices. During audit time, many others joined her, and the traffic was crazy. They would spend untold hours searching, copying, removing and replacing folders. To top it all off, they would typically have to “put off” the inquiring person, and call them back while they searched. Archive and Storage – Long term storage costs can quickly multiply, especially if you are using an off-site storage provider. For growing companies, floor space is a huge consideration, and with the average file cabinet taking up 10-12 square feet of space, costs can quickly add up. Finally, there is the concern of disaster recovery. You cannot backup paper, and all it takes is a fire or triggered sprinkler to destroy important records.